Redress Fashion Show & Conference tickets on sale now!! Redress Raleigh Fashion Show Tickets are on sale online now!!! Share, post, and ask your friends and family to attend! Redress Eco-Fashion & Textile Conference Registration Tickets are also available!! If you know any other entrepreneurs, designers, artists, or community members who would be interested in attending, please help us spread the word! This is a great networking and educational opportunity, at a beautiful location with wonderful people! 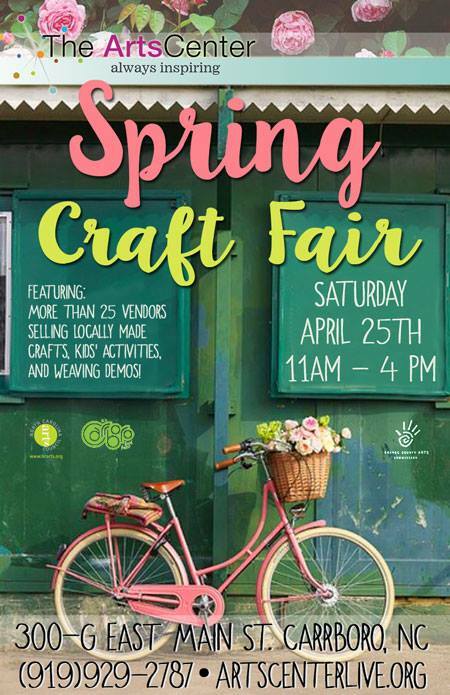 Carrboro Spring Craft Fair …This Saturday! Come out to the always-lovely Arts Center in Carrboro this Saturday, 11-4, for the Carrboro Spring Craft Fair! Tickets on sale now for Redress Raleigh Spring Fashion Show!! This year, the show will be at the Lincoln Theater in downtown Raleigh! The Redress Spring Fashion Show is the premier eco-fashion showcase of the Southeast. The Redress fashion show highlights designers with accessible and innovative collections as well as emphasizing that “green” is in all aspects of life, including fashion. The clothing selected for each show has a strong emphasis on eco-friendly design – examples include recycled, upcycled, or remanufactured garments; eco-friendly fabrics and/or sustainable production processes (such as no-waste pattern making or natural dyes); and/or a domestic supply chain.